- The GSM 3G M2M RTU is an industrial class, high reliability, high stability, and programmable Remote Terminal Unit (RTU). - It embedded 32-Bit High Performance Microprocessor MCU, inbuilt industrial Cellular module. It provides 4 digital inputs, 4 analog or PT100 Resistance Temperature Detector (RTD) inputs, 4 relay outputs, 1 ambient sensor input for monitoring onsite temperature and humidity. - It can monitoring and operates the I/O ports by SMS, APP, Web Server, internet, timers and programmed inter-lock events automatically. - This is very useful if you need remote control onsite devices with low cost solution. - Widely used in a variety of industrial automation, security monitoring system, automatically measurement and control system, remote data acquisition, telemetrically systems, automatically control system. Due to the manual measurement and lighting effects, there is a slightdifference between the size and color from the above and the actualitem. 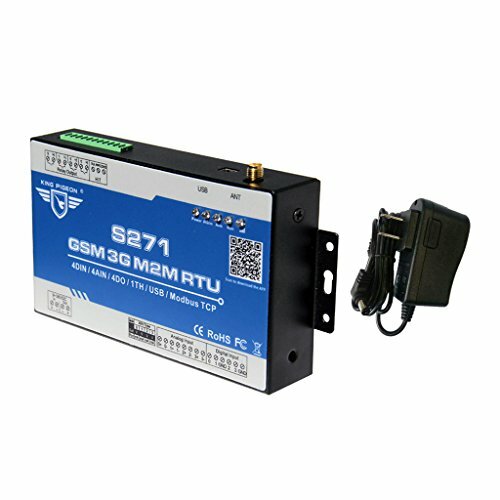 The GSM 3G M2M RTU is an industrial class, high reliability, high stability, and programmable Remote Terminal Unit (RTU). It embedded 32-Bit High Performance Microprocessor MCU, inbuilt industrial Cellular module. It provides 4 digital inputs, 4 analog or PT100 Resistance Temperature Detector (RTD) inputs, 4 relay outputs, 1 ambient sensor input for monitoring onsite temperature and humidity. It can monitoring and operates the I/O ports by SMS, APP, Web Server, internet, timers and programmed inter-lock events automatically. This is very useful if you need remote control onsite devices with low cost solution. Widely used in a variety of industrial automation, security monitoring system, automatically measurement and control system, remote data acquisition, telemetrically systems, automatically control system. If you have any questions about this product by MonkeyJack, contact us by completing and submitting the form below. If you are looking for a specif part number, please include it with your message.